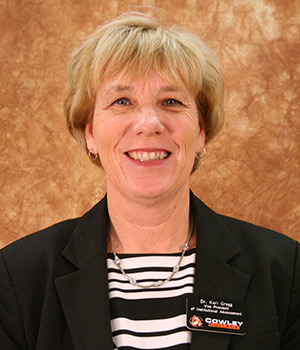 The community is invited to attend a meet and greet reception for Dr. Kori Gregg, the newly hired vice president of institutional advancement at Cowley College. The reception will be held Monday, August 29 from 4-5:30 p.m. in the Earle N. Wright Community Room. Dr. Gregg has over 25 years of experience in community college and university settings. Her previous positions have included tenure as a full-time faculty in accounting, department chair, dean, vice-president, and special assistant to the president. In her previous academic position, Dr. Gregg served as the vice president for entrepreneurship and innovation, a position responsible for developing a cross campus culture of innovation through the embedding of entrepreneurship across the curriculum. Included in this work was the development of a grant fund which allowed students the opportunity to receive up to a $500 grant to pursue an idea or social/commercial enterprise. Over 100 grants were awarded to enterprising students which directly led to the creation of student run ventures, development of non-profits, community programs and student organizations. Throughout all of her positions, Dr. Gregg has been an avid fundraiser and has been successful in garnering sizable gifts while working closely with alumni and donors. Dr. Gregg also has significant industry experience and has held executive positions in accounting and operations. Dr. Gregg is a frequent lecturer and keynote speaker in the areas of: Leadership, Gender differences in Leadership styles and Communication, Working through Change, and Innovative Organizations. As a Harvard trained facilitator, Dr. Gregg works with organizational groups to overcome immunity to change and helps to facilitate a more positive approach to change. Dr. Gregg is a published author and has written extensively on leadership, entrepreneurship, innovation and change management. In her leisure time, Dr. Gregg is an avid mountain climber and traveler and has visited all seven continents, most recently Antarctica in January 2016.